Breakfast is really important to our family. Growing up, I remember rarely skipping breakfast. Either my mom would cook or she would hand me a wad of money to buy breakfast from the street vendors. Now, it’s even more important to continue that tradition for Aiden. We’ve been trying to be more creative with our options, expanding beyond Vietnamese noodles and porridge or American pancakes and oatmeal. My mom stockpiles puff pastry from a wonderful Persian supermarket that makes the perfect pastry, each sheet already precut. I’ve been experimenting with puff pastry, making breakfast tarts with ingredients inspired by my favorite pizzas. I would love a good breakfast pizza but busy mornings call for easy breakfast options instead of making the dough, waiting for it to rise, and rolling it out. 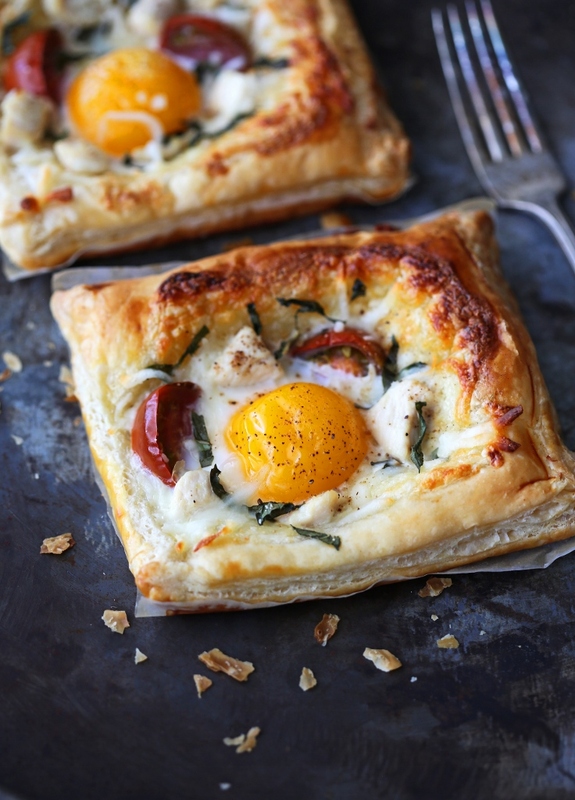 This chicken and egg breakfast tart is filling and will keep you going until noon. It has everything you need, carb, protein, dairy, and veggies. If you’re a vegetarian, skip the chicken and you’ll still have a delicious breakfast tart. Now go make some! 1. Thaw the puff pastry according to the package directions. Line a baking sheet with parchment paper and place the puff pastry on the baking sheet. 2. Fold over one fourth of an inch on each edge of the square and press down to form a rim. Use a fork and prick inside the rim of each pastry square to prevent the center of the pastry from puffing up while baking. 3. Whisk one egg in a small bowl until frothy and brush each square with the egg. Cover and refrigerate for 15 minutes. 5. In a small skillet over medium heat, heat the olive oil. Add the minced garlic and let it saute until fragrant, but not browned. 6. Add the cubed chicken and cook until no longer pink, about 5 minutes. Season with salt and pepper to taste. 7. In a small mixing bowl, add the heavy cream and ¼ cup of cheese. Spread the cream and cheese mixture equally between the center of the pastry squares. 8. Bake in the oven for 12-15 minutes or until light golden brown. 9. Remove the puff pastry from the oven. 10. Add 1 egg yolk to each square. 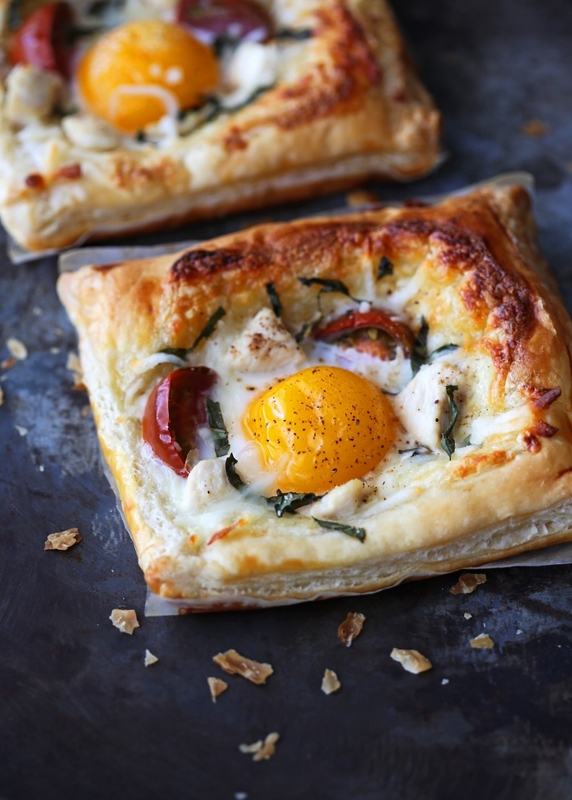 Arrange the cooked chicken, tomatoes, and basil leaves on the pastry making sure not to break the yolk. Sprinkle the remaining 2 tablespoons of cheese over the tarts. 11. Bake for another 5-7 minutes, until the egg yolks are slightly cooked. 12. Sprinkle with salt and pepper to taste. Serve immediately.